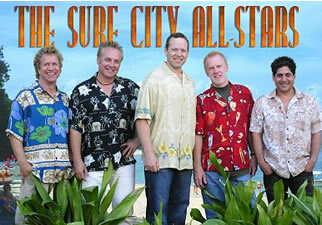 Beach party band SURF CITY ALLSTARS counts surf rock legends among their members. Matt Jardine on bass and vocals, Gary Griffin on keyboards and David Logeman on drums join the band from the Beach Boys, while Don Raymond on guitar joins from The Ventures and Jan & Dean. Formed in the early 80′s, each member has had a long career in surf and beach music. The Allstars have that authentic surf sound and harmonies made famous by Brian Wilson and Mike Love.